One of the most famous weapons from has made its way into the real world thanks to some expert blacksmithing from a Hollywood prop maker. Tony Swatton is a blacksmith from London, England who found fame in a YouTube series called "Man at Arms, " where he would recreate a famous piece of Hollywood hardware. During his stint on the show, Swatton built real-world versions of the Klingon Bat'leth, Link's Master Sword, Halo's Energy Sword, and a slew of other famous weapons. Last year, Swatton handed the series over to a crew of new craftsmen, but he hasn't given up the hammer just yet. So, when Blizzard approached the seasoned smithy to create a replica of the Gorehowl from World of Warcraft, Swatton happily signed on. If you're a WoW aficionado, you obviously understand this weapon's importance in Warcraftian lore. The Gorehowl is the weapon that Grommash Hellscream used to kill Mannoroth and lift the blood curse from the orcan race. His storyline stretches back to, and he played a major role in . Plus, he's the central antagonist in "Warlords of Draenor." 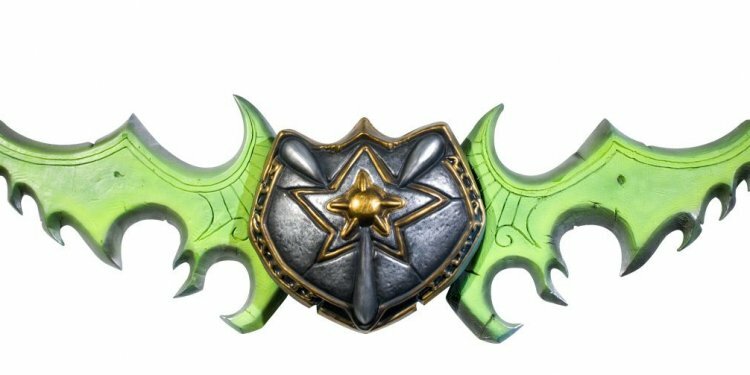 So, for many World of Warcraft players, watching this in-game item become a real-life weapon is something close to a religious experience. After checking out Blizzard's models and taking a few measurements, Swatton decided against casting the Gorehowl out of solid metal. Compared to Orcs, real-world humans have the lifting capacity of a nursing home resident with a vitamin deficiency. So, a 600-pound axe isn't very realistic. Instead, Swatton crafted the axe head around a wooden core, customizing the outer shell with welded metal. This meant that the axe would maintain the look of the digital version, but it'd be light enough for our tiny, human arms. If this kind of game-related blacksmithing is something that you enjoy, be sure to check out Man At Arms' latest creation, Legend of Zelda's Hylian Shield.